At long last, it’s the wonderful month of April. Here in Portland, the cherry trees are blooming and there’s an energy in the air as winter releases its grip. April is also the time to show your serious support for the planet. Earth Day is on April 22. This year the Earth Day Network is organizing the huge “March for Science” in Washington D.C. on that day. In my work, I happily focus on the intersection of the earth and business every day. But this year, April’s Earth festivities call for “all-hands-on-deck.” And you can help. The new administration has chosen to withdraw its support from the Clean Power Plan, sign off on building the Keystone pipeline that carries fossil fuel, and label global warming a “concept … invented by the Chinese” – to name just a few truly awful actions. In fact, global warming is something that scientists have been worried about since the 1980s. And for many of us regular citizens, it’s something we have seen with our own eyes. Think Hurricane Katrina in 2005, Superstorm Sandy in 2012, or the massive wildfires that burned over 10 million U.S. acres in 2015 alone. I am baffled that the feds have chosen to ignore the hundreds of thousands of American jobs that come with renewable energy, smart home technologies, and electric vehicles. There are endless business opportunities, right here in America, for everything from sustainable fashion to sustainable agriculture. I moved to Portland, OR because the city has a well-deserved reputation, not only for being weird and making lots of craft beer, but also for being “green.” My apartment building is LEED-certified, the public transit is so good that we sold one of our two cars, and there are more farmers markets offering organic food and locally made goods than I can shake a stick at. That’s the norm here. You may have heard that Nike and Intel have their headquarters here. But did you know that SolarWorld and Vestas (the world’s largest builder of wind turbines) are just down the street too? Did you also know that “wind turbine technician” is one of the most sought-after employees right now? I’d rather support American jobs and American workers, and green businesses do that far better than organizations that outsource overseas. Indeed, “green” thinking is so embedded here that it starts early. I recently read of the Portland teen who developed a portable solar panel that homeless people can use to power lights or devices. Marching in Portland’s “sister march” for the big March for Science on April 22. Much as I’d like to be in D.C., flying from Portland to D.C. would just create more greenhouse gas emissions. Here, I can walk to what I expect will be a big march, and still get my point across. To those who think “it won’t make a difference,” I beg to differ. Mentoring a student from a local university. Starting this month, I’ll share my career experiences with a Portland State University student who majors in Sustainability. I want these kids to succeed, even if I have more mistakes to share than victories. Continue telling the truth on this blog about climate change and business. Because climate change is a clear and present danger. And businesses can remain profitable while addressing it. Facts matter. We ignore them at our peril. Check out the sister marches in your area and go. April 22 is a Saturday, so you’re off work (I hope)! I suspect you’ll find an amazing amount of camaraderie there. If you’re not the marching type, write a letter to your local paper about how important you know climate change is. Did you know that subscriptions to newspapers like the New York Times and Washington Post since the election? Your words will reach more people than you might think! Get involved at the state and local level. While I salute all the folks who have decided to run for office – everything from local school boards to state wide office – that takes time. Go to your Congressional Town Hall that will be held this month and speak up about climate change, clean energy and green American jobs. Let’s make April awesome for the planet! Wow – the long silence on my blog is exactly what I tell clients not to do, and it’s officially over. You may know that old saying, “the cobblers children have no shoes.” In this case, the professional writer has had no posts, but you may be interested to know why. In the last 4 months, I have moved my family and my business from Florida to the West coast – Portland, Oregon to be exact. We packed off our one-and-only, best-possible-daughter to college. And I’ve begun to get to know the vibrant green business community that exists in my new home city. 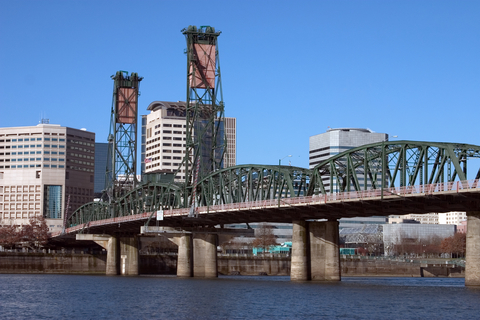 Yes, while you may think of Portland as the land of beer and coffee (both true! ), it is also something of a “green Grand Central” in terms of green living, green business and green government policies. And it’s this latter fact that calls to me. In the 3 Presidential debates that (thankfully) just ended, not a single question was asked about climate change (CC). Yet 2016 is a year that, according to experts, will once again be the hottest on record. The 2016 hurricane season is not done, yet we’ve already seen hundreds of Haitians die and millions of Americans in the Southeast evacuate due to Hurricane Matthew. Portlanders “get” that climate change is real, and they are doing something about it. I like being part of that. Doing my small part – with you! The disconnect between what needs to happen to address climate change and what is actually happening continues to amaze me. There is a speed and scale of action that needs to ramp up now, and the good news is, you can help! Know that sustainability means profitability. The idea that sustainable choices always cost more than they return is hopelessly outdated. Most companies are too busy to know that, for example, (1) the price of solar panels has fallen 80% in the last 5 years or that (2) relatively small changes – like swapping out incandescent lights for LEDs that cost one-tenth of the old bulbs – can drop money to the bottom line immediately. The “clean trillion” is a term first coined by Ceres.org. It quantifies just how big the opportunities for green business are. You can do your part to stop climate change and profit quite nicely at the same time. Tell your story of green success – or challenges. The lack of awareness around climate change – not to mention the misinformation out there – can be remedied by telling your real-life stories of adopting more sustainable business practices. The more stories, the better. Even not-so-successful attempts help other businesses to properly assess their opportunities. Not sure what to say? I can help! Keep learning. New products and services that make it increasingly easy and cost-effective for businesses to “go green” launch every day. From “smart buildings” to new transportation options, the world around us is being “disrupted” (to use an overused word) on all sides. Staying abreast of all this is a challenge, but also an opportunity to find the green options that best suit your business. 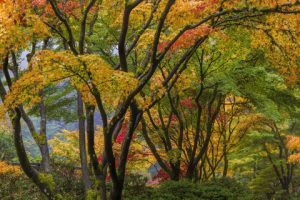 So while I am enjoying fall colors again for the first time in 16 years, I am also looking forward to helping YOU share your green successes – and challenges – through web content, blog posts, or case studies. Whether your organization is conserving water or designing a LEED Platinum office building, it’s important to get the word out to your customers, suppliers and communities. 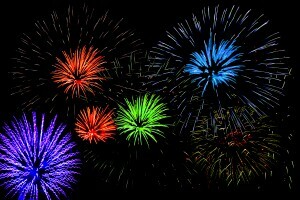 This month, I celebrate 5 years with Great Green Content, helping companies share their stories of sustainable success. What green business story can I help YOU share? Eckerd College teaches students how to launch green businesses. Green business is part of the curriculum. I give a big shout out to Eckerd College and Professor Laura Singleton for teaching the course. It’s an intensive class to help students learn about, articulate and actually pitch a green business plan within one month. I like the fact that the class has such a practical, actionable focus. Green business is not some airy-fairy, far-away dream. It’s here now and we need more people like these students jumping in to the pool. There were no slackers in this crowd. Far from tapping away on their smartphones while I spoke, these students were engaged. I was bombarded with questions ranging from “How do you handle greenwashing?” to “Why do you think the government in Florida bans people from talking about climate change?” to “You say your hybrid car is a good thing, but what are we going to do about those toxic batteries?” These are thoughtful, informed questions that say good things about the students asking them. These students GET climate change. They know that climate change is real, and they know that they will likely bear the brunt of it. Not one student asked, “But isn’t climate change a hoax?” Not one student asked, “But won’t addressing climate change destroy our economy?” It’s a given. These students give me hope. Green business means big bucks. I shared with the class a recent article from The Guardian listing the 9 companies that currently make $1 billion a year or more with sustainable products. That’s “billion” with a “b.” Target is the tenth company that will join this ranking. While my green business is small, there will be a need for green businesses of every size and shape. That’s exciting for people looking for a place in a new, green economy. Climate Progress – this is more about climate change than business, but many business-related articles appear. 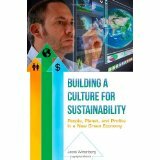 American Sustainable Business Council – this group is located in D.C. and has a public policy bent, but the name says it all. WeMeanBusinessCoalition.org – this came out of the Paris Climate Talks. Mike Bloomberg (of Bloomberg Business Week) is one of the business people who has gotten involved in the green economy in a big way. Ceres.org – while this is a nonprofit, they work mostly with for profit-businesses to help them understand and adopt more sustainable business practices. Newsweek 2015 Green Business Rankings – normally I avoid lists like this, but it does give a sense of the sheer scope of green business today. Sustainable Brands.com – the link is to an article about the Circular Economy, but SB is one of the heavy hitters in the green business space. Sustainable Business.com – Rona Fried is the woman behind this site, and she curates a daily stream of interesting news articles about sustainable business. The Guardian Sustainable Business section– source of the “9 Billion Dollar Companies” article above. Triple Pundit.com – all the latest on balancing people, planet and profit – the Triple Bottom Line. As I told the class, this is just the tip of the iceberg. Whether you are looking for ideas for a green business to start, a green job to train for, or a green company to work for there is plenty of opportunity. Be bold – don’t wait – you can do this! Yesterday, I ordered my Tzoa – a new, wearable device that measures air pollution as I go about my day. I’m really excited, even though I have to wait a year to get it. A Tzoa is a wearable device that measures air pollution. “What’s that?” you say. “That doesn’t sound cool at all! That’s no Apple Watch, no Surface Pro, no Facebook app.” Surely, I have lost my mind. Or not. Actually, I’d love for you to join me in supporting Tzoa’s Indiegogo campaign that kicked off yesterday. And no, I am not being paid to say that. A Tzoa creates and shares clean air data that is currently unavailable. The Tzoa accurately senses air pollution and shares that information with everyone. The data from everyone who wears a Tzoa gets uploaded to the cloud, and crunched into things like maps, recommendations for where to avoid the pollen, and where the least polluted bike route is. The data will be available on your smartphone. As a data geek, it’s like seeing a whole new sandbox created. Happiness! It’s easy. As a veteran Fitbit One wearer, I know that wearing the Tzoa will be no big deal. As a matter of fact, I expect it may be a conversation starter. “Gee, what’s that shiny, sleek thing clipped to your arm/jacket/purse strap?” they’ll ask. I really want to know. When I started my business, I was happy (and, if I’m honest, a little smug) to work in a home office. Then, I learned that indoor air can be more polluted than outdoor air! I am genuinely interested to find out what the Tzoa will tell me, and adjust my work environment if necessary. I support businesses like Tzoa that are actively reinventing our economy and our lives with regards to climate and the environment. Through Indiegogo, you can chip in as little as $5 to make this product come to market. Tzoa lets me be part of the action. The Tzoa is small enough, and accurate enough to create whole new sets of air pollution data. Everyone from government agencies to fellow citizens can use it. I’ve long liked the idea of being a “citizen scientist,” and Tzoa lets me be one! Wouldn’t YOU like to know how clean the air around you is – both indoors and out? I would. And to feel the satisfaction of sharing that data – effortlessly – with people around the world? I’d say that’s pretty cool. MIT’s Climate CoLab Wants You! This week I’m passing along an invite to you from MIT’s Climate CoLab. The CoLab is a crowdsourcing platform where citizens work with experts and each other to create, analyze, and select detailed proposals for what to do about climate change. On March 6, The CoLab launched some 22 new contests on everything from our energy supply to transportation options to a U.S. carbon price. These contests are open to everyone. You can contribute to an existing proposal or create your own. Proposals can win a “popular” vote and they can be judged as winners by a panel of experts. The winner takes home a Grand Prize of $10,000 and gets the opportunity to present their proposal to experts who can help implement the idea. In 2014, Danielle Dahan took home the Grand Prize award for a proposal to Improve Building Energy Performance: Green Job Skills Training. It addresses the shortage of qualified personnel to maintain the increasingly sophisticated heating, ventilation and air conditioning (HVAC) systems installed in green buildings today. “As high performance green buildings increase in complexity,” Dahan wrote in her proposal, “we need to give building technicians the skills to maintain buildings and achieve high performance energy goals.” The curriculum, when in full motion, is projected to save 33 trillion metric tons of carbon each year in the United States alone. It’s a great use of crowdsourcing. MIT knows that, as one institution, it can’t possibly house all the potentially life-changing, climate-saving ideas within its walls. So it has thrown open the doors to the world and said, “Come help figure this out.” With more diverse ideas – and more efficient ways to vet them – we can find and scale the solutions that work sooner. It’s a hub of activity. As of January 2015, over 270,000 people have visited the Climate CoLab, representing every country in the world, and over 30,000 have registered as members. The CoLab community also includes over 7,000 Facebook likes and 17,000 Twitter followers. To learn more about the Climate CoLab community, click here. It’s a fun way to tackle a critical issue. Because climate change is such a multi-faceted challenge, there are endless aspects to focus on. Choose the one that interests you most, and dive in! The new contests are open now. Peruse your choices (there are about 7 of these I’d sign up for in a heartbeat). Or add your own new idea. You must enter before Saturday, May 16, 11:59:59 PM Eastern Time. The CoLab sponsors tell you when voting on the various proposals will occur. If history is any guide, the awards will be announced around November 2015. So join in. You might just make the world a better place – for all of us! My New Year is off to a fast start, and that’s a happy thing. Today I’m sharing some posts that I wrote late last year and early this about cars, food, jets and the circular (green) economy. Disclaimer: I was paid to write these for Earth911.com – a client – although not by the individual companies. I think the information is useful. Earth911.com is a treasure trove of information. As I work with businesses and talk to people, I am struck by the continuing lack of awareness around green businesses and the products they create. Green business is not a “scam” or a “hoax” or a “threat to jobs.” On the contrary, green businesses are here today. Green businesses range from behemoths like Google to tiny ones like Great Green Content. They are profitable AND they minimize harm to the planet. California alone will pass 500,000 clean energy jobs in 2015, up 17% from 2014. And while the oil and gas industries have grown with the shale oil boom, scientists have told us for years that using fossil fuels puts greenhouse gas emissions in the air, which leads to global warming, which leads to climate change. And all the droughts, floods, storms, property damage and weather-related insurance claims that that entails. Fossil fuels need to stay in the ground. It reminds me of a bumper sticker I saw when I lived in North Carolina. It said, “Tobacco put my kids through school.” Unfortunately, that tobacco probably killed or sickened people as well. People need jobs, but not jobs that harm other people. So here is a sample of my articles. It heartens me to know that green business is taking off in all directions. And I want YOU to be heartened – and more aware – too! Really, this is just the tip of the green business iceberg. I’ll be writing weekly for Earth911.com, so if you are interested in even one of these, there are plenty more on tap. Celebrating Clients and Welcoming 2015! As the old year wraps, this post celebrates just some of my clients and the wonderful work they do. It’s an easy post to write. Each client makes the world a better place, and collectively they make it fun – yes, FUN – to go to work in the morning. To all my clients: thanks for what you do. This post’s for you! Bob LeVine and Selective College Consulting had an exciting 2014. SCC assisted over 80 high school students seeking admission to the colleges of their choice. Bob LeVine, former Chairman of the Harvard Schools Committee for the West Coast of Florida, understands the methods used by admissions committees during the selection process. SCC teaches the techniques necessary to maximize an applicant’s chances of gaining admission to colleges of choice, especially the most highly-selective colleges. For 2015, SCC has a new, more robust Premier Package offering service not available anywhere else in the world. In early 2015, SCC will host several free seminars on “What Juniors Need to Know (about College Admissions)” around Tampa Bay. Chase Ezell and Earth911 had a bang-up 2014. For over 20 years, Earth911 has positioned itself as the recycling authority. Their recycling directory provides consumers and business with over 1.6 million ways to recycle more than 350 different materials. Earth911 also provides fresh, targeted content daily, helping consumers live a more environmentally responsible lifestyle. 2014 highlights included the launch of the YouChange™ marketplace powered by Earth911 – packed with eco-conscious products. Another 2014 highlight was the launch of Earth911TV. Earth911’s goal is to continue to be the leader in helping consumers and business reduce their daily waste. You are a part of the solution. Come join us in 2015! David Reed and the Sustany Foundation had a truly memorable 2014. The ever-popular Sustany Buzz in November – the annual riverside celebration of sustainable living in Tampa – flirted with 1000 attendees this year. Earth Day saw the first “Sustainable Restaurant Walking Tour” in downtown Tampa. Attendees sampled treats from several restaurants newly certified as City of Tampa Sustainable Businesses. Sustany’s mini-grant program funded practical and effective efforts like the Tampa Eden project, which built a new community garden. And Sustany was nominated for a “Sustainable Florida 2014 Best Practice Award.” 2015 promises to be a year of explosive growth as the Sustany Foundation and Tampa’s Sustainable Business Coalition combine efforts for even greater impact. Hugo Amorim at Brandpendulum is looking forward to 2015. Hugo helps businesses tell their stories in engaging and delightful ways so that they can reach their true potential. He does this by designing logos, websites, and marketing materials within an overarching brand strategy. He works on projects that he knows will have the greatest impact on his client’s business. Working with Hugo is like having a business partner without the equity. He focuses on strategy first, and design second – Hugo doesn’t design for design’s sake. He is candid, open and objective. If you’re looking for a designer who is also a strategic thinker, feel free to contact Hugo at Hugo@brandpendulum.com. Julie Klein at Confluence Sustainability specializes in sustainability strategies and solutions that use travel and tourism as a catalyst. Her work supports leading international travel destinations such as Vail, CO (coinciding with the 2015 World FIS Alpine Ski Championships) and Jackson Hole, WY in building collaborative sustainability leadership between businesses and community leaders. Projects took her coast-to-coast to support Hostelling International USA as they pursue a globally recognized sustainability certification. She is wrapping up the year with waste management and diversion strategy work for UNEP and the Small Island Developing States (SIDS) program. Passionate about the power of travel and tourism in advancing sustainable development, Julie continues to work closely with Sustainable Travel International on several initiatives that foster their mission of tourism as a force for good. Lisa Merlo-Booth and the Relational Centre has a laser focus on empowering women and guiding couples into happier, healthier relationships. In 2014, Lisa gave workshops for women and couples around the country on her groundbreaking work–incorporating a Grounded Powerful Strength (GPS) in how you walk in the world. She coached dozens of couples to turn their relationships into ones that fuel them rather than drain them. She will be launching a new campaign in 2015, “Change It,” to help men and women stop settling for bad relationships, jobs and lives. Through January 21, 2015, she is taking registrations for her new teleclass for mental health professionals called “Working Your Edges.” This class provides therapists, counselors and coaches a safe and confidential place to learn to better manage their most difficult clients. As Lisa says, “You deserve great things.” And she knows how to help you get them. Megan Everett at Tools-N-Pros is rolling out new service packages and infoproducts in 2015, based on decades of supporting both online and offline businesses. She works primarily with larger businesses that need ongoing help to manage all the “moving pieces” as they grow. Services range from creating business plans, to consulting and quarterly reviews, to providing key reports, to finding and managing the contractors they need for specialized tasks. For businesses with smaller budgets, she provides stand-alone infoproducts that walk them or their assistants through all the steps needed to complete specific projects. Solutions can be created and/or customized upon request. Wishing you all a wonderful holiday season and a successful New Year! Rebecca Mullen is the author of the class A Soulful Cleanse, where participants come to figure out the source of their clutter habits and find a new, liberated way forward. She is newly partnering with her local ski area to harness the power of fear and fly down the mountain of life. Enjoy a free session with Rebecca to see if coaching with her might be a fit for you. That’s the scoop! I wish you all a happy and healthy New Year! Lining Up for the Climate March – Where Will You Be? So I’m starting to get excited about this Sunday’s Climate March in New York City. 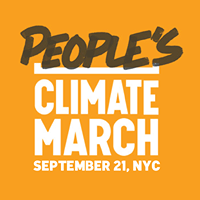 The People’s Climate March happens September 21, 2014. I’ll be there to add my voice – as both a citizen and a green business owner – to thousands of others, to call for action now on climate change. I’ll be joining the “We Have the Solutions” group, which includes “clean and green businesses.” Both the number of organizations participating – now over 1400 – and their sheer diversity is staggering. From native Americans to gray-haired grannies, from scientists to nurses, the list of partners is mind-boggling. My thanks to the organizers of the march for laying it out so clearly. It looks like the weather is going to cooperate. 🙂 Where will you be on Sunday? Last week the American Sustainable Business Council released new research on the attitudes of small business owners about climate change. The results very much track my own concerns as a small, green business owner. The American Sustainable Business Council polled small business. They are concerned about climate change. 87% of small businesses named one or more consequences of climate change as potentially harmful to their business, including higher energy costs, power outages, and rising health care costs. They know extreme weather is a threat. 53% of companies think extreme weather has, or will have, a negative impact on their businesses. One in five has already been hurt. As a small business in Florida, the concerns highlighted by the research are very real and very now. If the effects of climate change seem abstract to you, let me make it “realer” for you. Losing electric power. If I lose power, I lose my laptop, my internet connection and my phone connection. That means my work for clients is interrupted. Since I promise clients that I’m dependable – i.e. I’ll meet or beat their deadline – this is bad news. I am dependable, but if my power source isn’t, then suddenly I’m not either. I’ve never had a power interruption that affected a client. But I have started considering backup systems like a generator. That’s a big expense ($5,000 or more) for a small business. Flooding. I am far from the beach in miles. But Tampa Bay is very flat. A “perfect storm” that hits just right could push a LOT of water inland at the same time that torrential rains fall. An unlikely scenario? Perhaps. But that’s probably what the folks in the New York subway system thought just before the water from Hurricane Sandy started pouring into the tunnels under the city. A prudent business has to prepare for possible risks, and that includes climate risks. Hurricane damage. High winds can do structural damage. My home office is in a relatively new house, and roofs are more wind-resistant than they used to be. But the frequency and intensity of storms has been increasing. I can’t assume the roof is strong enough for every storm. So I’m happy to pass along ASBC’s research to a wider audience. From my perspective, it reflects the reality of climate change as a risk to my small business and millions more like it.